It happened: My mother suffered a stroke. In the short time since, our family has endured emotions like no other. The stroke left my mother with aphasia. A nurse described it best: Imagine that the computer on your desktop is processing perfectly – but it can’t send data effectively to the printer. As a result, when you print anything, it comes out in a confetti of mismatched words. My mom can think clearly. But if one doesn’t know her plight, when listening to her they’d think she’d lost her mind. Her thoughts and ideas all seem trapped. I want to be a better listener, because I want people to know I see them as a person. The next time we talk, don’t be surprised if I make the request: Tell me more. P.S. One of my mom’s favorite books is The 10 Greatest Gifts I Give My Children, written by our founder, Steven Vannoy. Simon & Schuster is planning a celebratory 20th anniversary launch this May. It’s worth rereading. Think about it; we have 2 ears and 1 mouth. 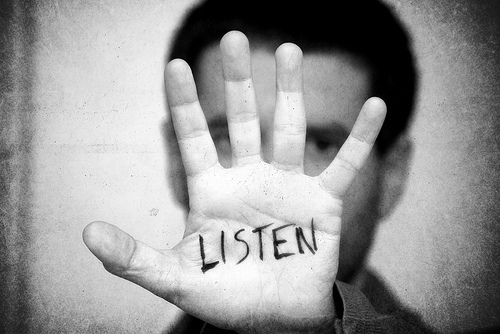 Stands to reason that we should be actively listening twice as much as we are speaking! Well said, Lydia. Thanks for the reminder! Lydia, your reminder to listen is so valuable. Being an excellent leader takes focus and creates so much value. Craig, Thank You for sharing… Nothing connects people more than the struggles we face. I will pray for your mother tonight. Your story reminds me of a statement made many years ago by the professor of a communications class I took at Regis University… “Communication is the ‘ART’ of shared meaning.” In every post you have mentioned ‘communication’, I have always come back to this simple statement as the cornerstone of what communication is intended to do. Please consider using it in some future post. Hank: Thank you for your powerful thoughts on communication being an art of shared meaning. I love your suggestion of this topic as a future post! Hank, you always impressed me as an assured student of life and leadership. Your words carry weight because you listen so well. Your comments here serve me as a reminder of the art of listening is the top strategy to build relationships – both at work and at home. This touched my heart deeply…thanks for sharing a personal story. Godspeed to your Mom and your family. This also had a strong impact on me I took the time to share this with my Supervisors as well. I asked them to take a step back and think about how many times they have had a conversation with an employee and remember what he/she said. At times I believe we get caught up in the day to day and forget to stop for a min and listen to our folks. Sometimes this makes a world of difference in an employee’s and Supervisors business relationship. Thanks you for sharing…. Jaun: What a powerful introspection to support us in our leadership. Thanks for sharing this post with others to support your organization in even more listening (and even more feeling heard). Juan, your awareness and application of that awareness is an inspiration to me. Your reminder to stop and listen is invaluable. Thanks. We have heard that “actions speak louder than words”. I aspire to that philosophy. In the case of this heartfelt story, “words are leading me into action”. We never know the situation that others are dealing with. Working on being a better lister. A quick note of gratitude for the notes posted here publicly as well as the many I’ve received personally. I’m struck by what so many of us have in common: When faced with challenges we look deep inside ourselves and discover a greater reason for stepping forward. I’m inspired by your words and support. Craig, thank you for sharing your personal story with us. This post was a powerful reminder of how important it is for us to truly listen to others, to show we value and respect them. It is far too easy to not listen as we race through our days. Many thanks and best wishes to you and your mom!